In 2013 the American Medical Association started clas­sifying obesity as a disease, a decision that still generates debate. The American Heart Association, the College of Cardiology, and the Obesity Society have also announced that obesity should be treated as a chronic disease. 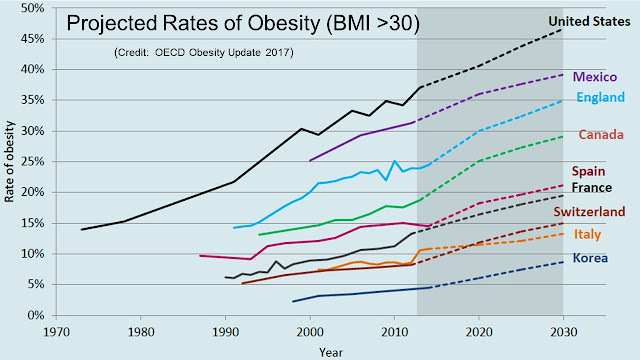 Obesity is a global phenomenon: After tens of thousands of human generations since evolution, obesity worldwide has only become widespread in the past 50 years - increasing more than six-fold since 1975 - the obesity epidemic came with astonishing speed. 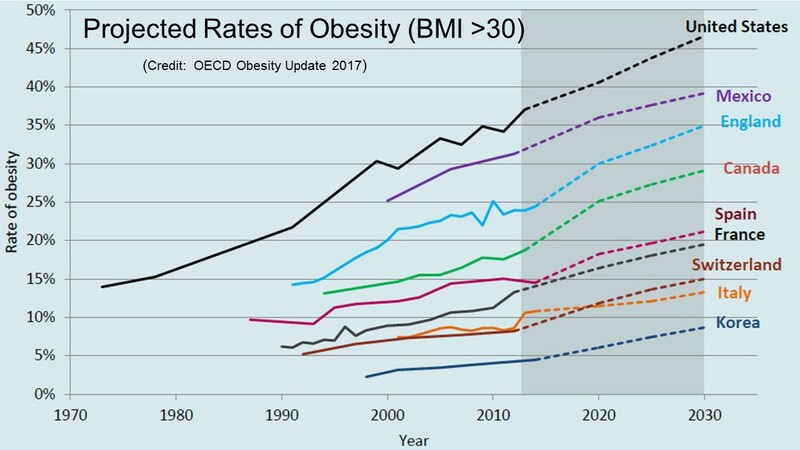 Obesity is expected to get much more prevalent over the coming decades with 2 in 3 adults turning obese in some countries by 2030. A good animation of how obesity has spread globally since 1972 may be seen here. You are obese if you weigh 20% or more than the normal weight for your height - i.e. if you have a body mass index (BMI) greater than 30. BMI is calculated by dividing your weight by the square of your height. 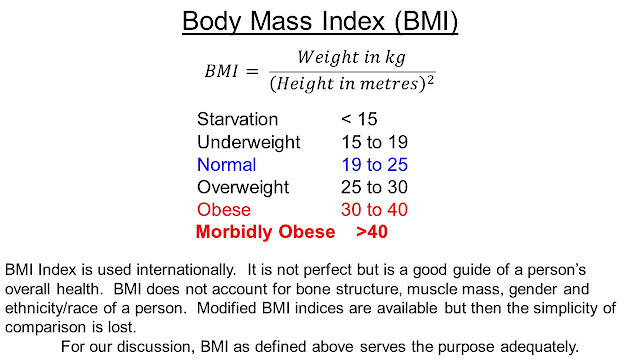 A BMI of 30 makes you obese - the acceptable range is 19 to 25. To be obese is like carrying a 15 kg suitcase everywhere you go - traveling or not !! Morbidly obese carry 50 kg extra weight 24 hours a day. What the extra baggage does to your body is not difficult to guess. 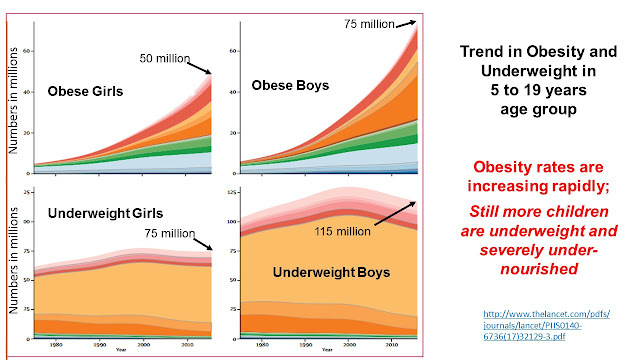 More and more children are getting obese too - at a much faster rate than adults! High Blood Pressure, Diabetes, Gout, Heart disease, Strokes, some Cancers, Joint problems, Osteoarthritis, Breathing problems, problems with sleep, Gallstones and more. The association between obesity and depression is also well established. The most comprehensive analysis of the relationship between BMI and mortality has been carried out by the Global BMI Mortality Collaboration which involves 500 investigators from over 300 institutions. They analysed 4 million individuals who never smoked and had no existing chronic diseases at the start of the study. Data from 10.6 million participants from 239 studies conducted between 1970 and 2015 in 32 countries formed the database. A total of 1.6 million deaths were recorded during this period. 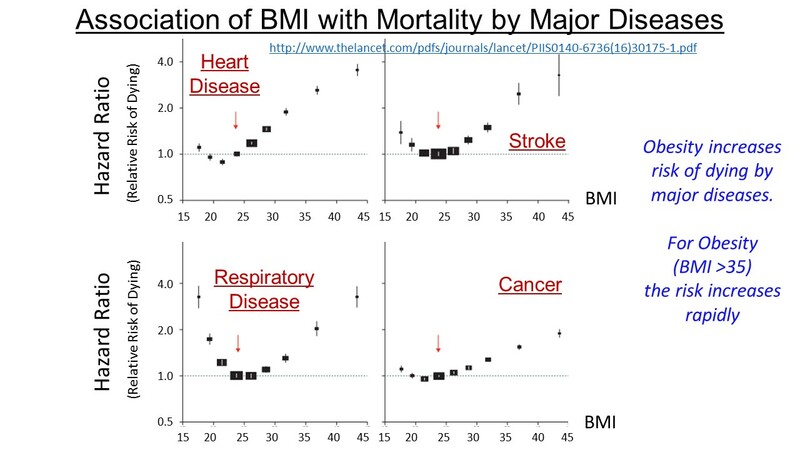 In the four continents studied, the association of both overweight and obesity with higher mortality were broadly consistent. An alternate way of looking at the data is provided by a recent analysis, published in the journal Nature (2017), of over 600,000 people. 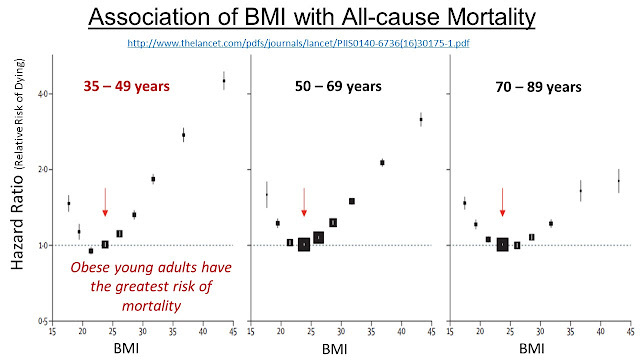 It concludes that a unit increase in the BMI value reduces lifespan by 7 months. 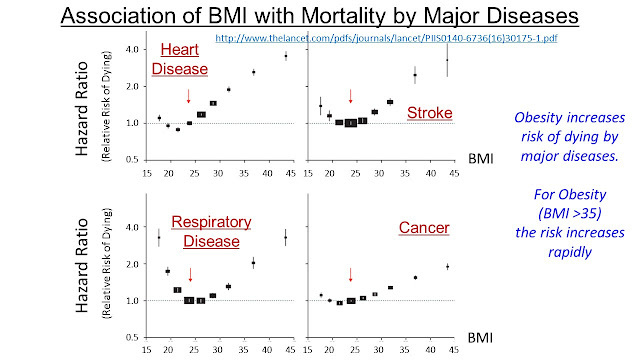 Obese (BMI = 30) will lose 3 years while morbidly obese (BMI = 40) will lose 9 years in lifespan. This is an eye-opener. 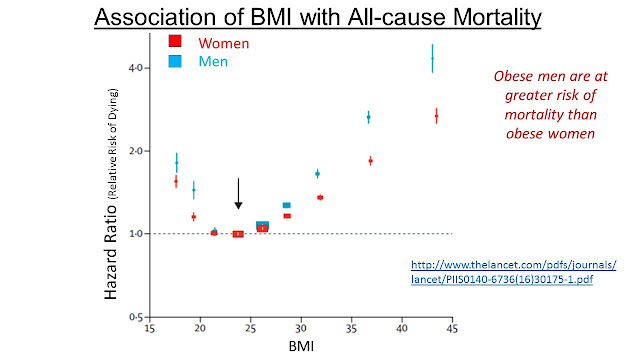 It is not only that the risk of mortality is greatly increased for obese people, their quality of life is also seriously impaired. 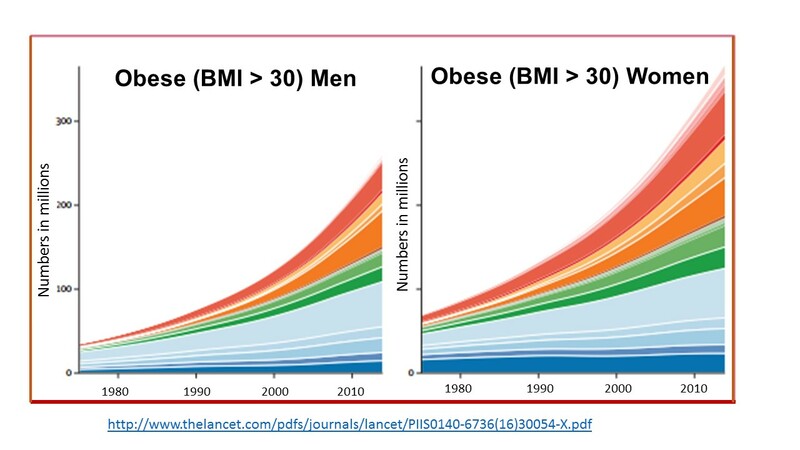 It is clear to me that obesity is a scrouge for global wellbeing and it is imperative that we find ways to control it. I shall show in the following that the prevailing obesogenic environment coupled with Big Food interests creates a toxic mix that prevents effective measures to be put in place for rolling back what some people call the obesity pandemic. Many initiatives have indeed been tried by authorities with little or no impact on obesity numbers. It seems that the problem of obesity, with all its negative impacts, is not going to go away. In the following, first we shall try to understand the reasons that have caused the obesity numbers to get out of hand, why measures to control it have failed and then look at the options we have. Why is Obesity Increasing? With all the problems with obesity, why is it not controlled? Only a very small percentage of the population was obese fifty years ago. It must be avoidable except in the few who suffer from certain medical conditions. 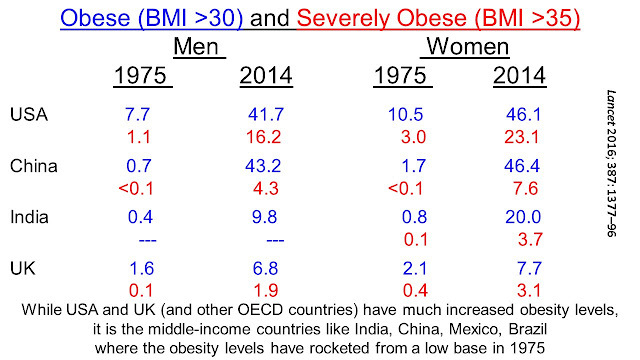 Obesity is a recent phenomenon and we need to look at the changes in society since about 1960. Obesity is not natural - if we look around, we find that it is only the humans and their pets who are obese. We do not see obese animals in the wild. Increase in obesity is a multifaceted issue and depends on the prevailing socio-economic environment. I can think of some factors like globalization, industrial practices, changes in food products, eating habits, lifestyle changes - all of which affect the way we live and eat. We are indeed consuming more calories now than we were fifty years ago. In the USA, average daily energy intake has increased by over 420 Calories or roughly 20% since 1970. This translates into a gain of 4 pounds per month or about 20 kg per year. The situation in many middle-income countries like China and India is even more serious where they have been changing over to western style diet of much greater processed food and ingredients containing greater proportions of fat and sugar. 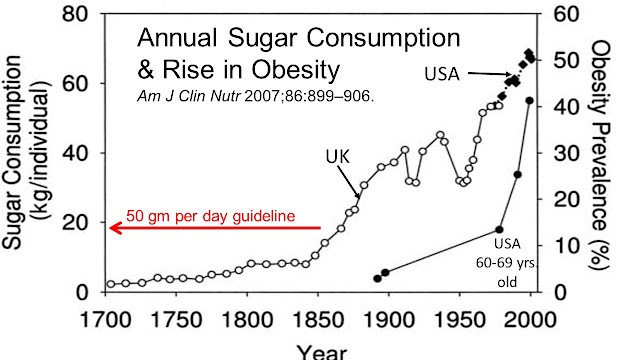 Consumption of sugar has gone up enormously over the past 300 years and is some four times higher than the WHO guideline of 50 gm per day; (see also). Obesity rates shown in the slide are for non-hispanic white population in USA in the age range from 60 to 69 years. 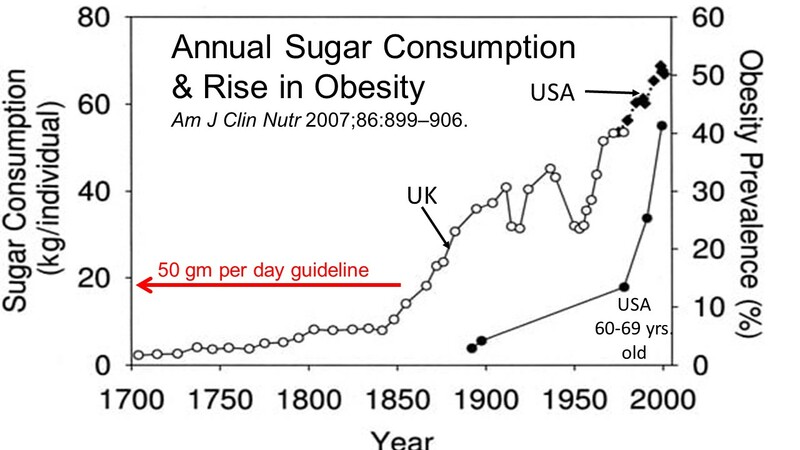 A word of caution here about inferring that sugar caused the increased obesity - while there is some correlation in increased sugar consumption and rise in obesity; this does not prove that sugar is the only factor responsible for this increase. For a healthy balanced diet, I do feel that sugar intake should not be greater than the guideline of 50 gm/day - this will indeed require a big change in the choices of food we make today. To reduce sugar consumption below 50 gm/day is very very difficult and is not a practical proposition. Since the middle of the twentieth century, many factors have affected the way we live and the way we eat our food. Lifestyle changes have been enormous. Traditionally, families used to eat out one or two times per week. Now, 50% of our meals are eaten in restaurants. Even food cooked at home is largely precooked and purchased in supermarkets. These meals are high in salt, sugar, fats and preservatives - they also contain much higher calories than home cooked meals prepared from fresh ingredients. The obvious question one asks - why do people consume more bad calories when they know that this will make them obese in the long term? Surveys have shown that even obese people do not generally like the way other obese people look. Many normal build persons definitely feel rather poorly about obese people, and at times are verbally and on occasions known to be even physically aggressive towards obese people (obesity or weight stigma - more on this later). Most obese want to lose weight - they go on diets - but find it difficult if not impossible to lose weight. It is not a matter of self control - obese definitely would prefer to get slimmer but they just do not seem to be able to shed the extra weight. We need to look at other factors that are fueling the obesity epidemic. 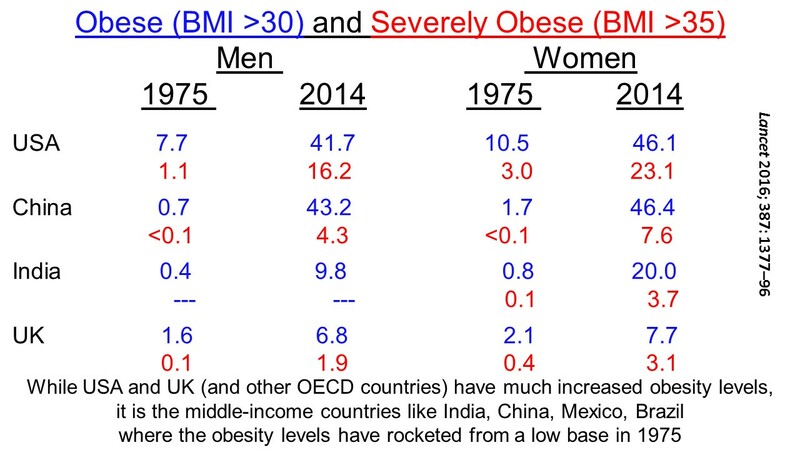 I shall discuss a few reasons that obesity numbers have taken off since 1970. The addictive nature of high sugar foods and adoption of an increasing more sedentary and stressful life-style are big hurdles in reducing obesity numbers. We also live in an obesogenic environment where food manufacturers, restaurants and supermarkets encourage us to consume more processed foods which are rich in fat and sugar content and have taste/flavour enhancers. Globalization has helped to spread the obesity epidemic to developing countries (1, 2) which were relatively free from this problem. Addiction is a primary, chronic disease of brain reward, motivation, memory and related circuitry. There is an increasing body of research that tells us that sugar could be as addictive as cocaine. Sugar activates the reward centre in our brain much the same way that drugs do and provoke similar cravings, binging and withdrawal symptoms. 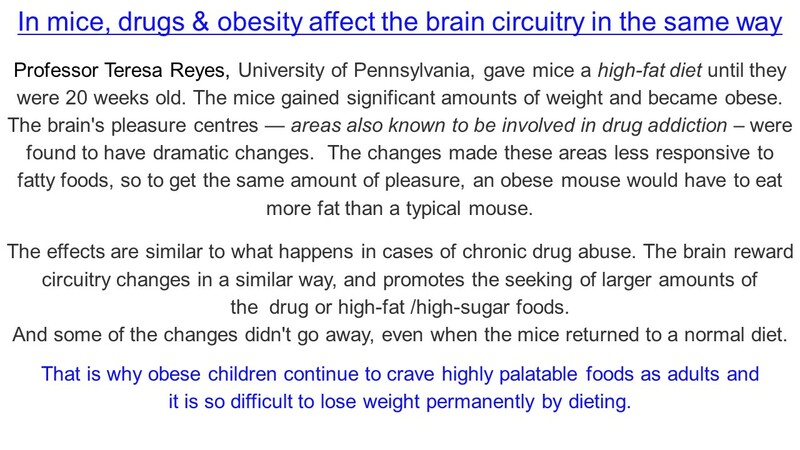 Eating too much of sweet or fatty foods can cause long term changes in the brain circuits that control eating behaviour. Drugs have been used by humans for a very long time - historically chewing leaves of certain plants to relieve pain. 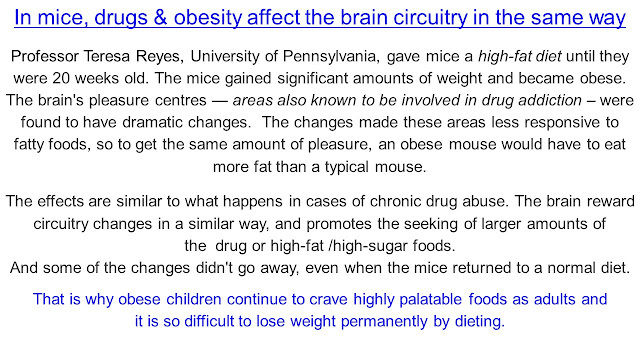 However, It appears that our brain circuitry evolved to promote food intake for survival and drug addiction is really hijacking some of these pathways. The addictive nature of sweet and fatty foods is widely accepted by professionals. 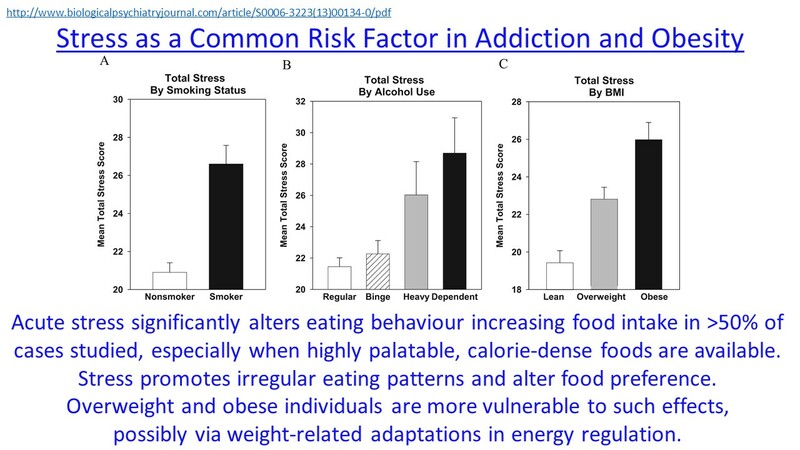 I give some links that go into more details of the mechanisms of addiction and worth a look to appreciate the similarity between drug abuse and obesity. The links are: 1 2 3. Understanding Stress: Stress is a condition where an environmental demand exceeds the natural regulatory capacity of an organism. In an organism, most biochemical processes strive to maintain equilibrium (homeostasis - the organism's optimal condition for living); an ideal condition. 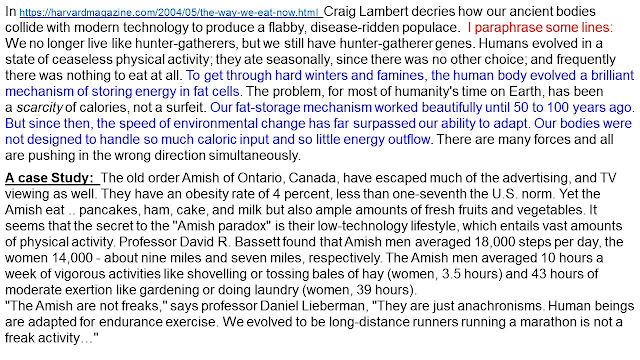 Environmental factors, internal or external stimuli continually disrupt homeostasis. Factors causing an organism's condition to diverge too far from homeostasis can be experienced as stress - factors like moving house or job, prolonged starvation, death of a loved one etc. can create a stress situation. Both acute and chronic stress can lead to changes in behaviour and physiology resulting in conditions like depression, delusions and anxiety. Stress levels have been increasing over recent times; A study claims that stress levels have soared by 30% in the past 30 years in USA. Obesity and Sedentary Life-Style: Modern man spends 50-70% of his waking hours in sedentary activity - defined as activity conducted in a sitting or reclining position involving low energy expenditure. 25-45% of waking hours are spent in performing low intensity physical activity and less than 5% in medium/high intensity physical activity. A typical American is sitting down for about 60% of the waking hours. Humans, as hunter-gatherers, evolved when they were engaged in prolonged physical activity; modern lifestyle of excessive sedentary behaviour poses an independent risk factor for a wide range of medical problems such as obesity, diabetes mellitus, poor cardiovascular health and more. 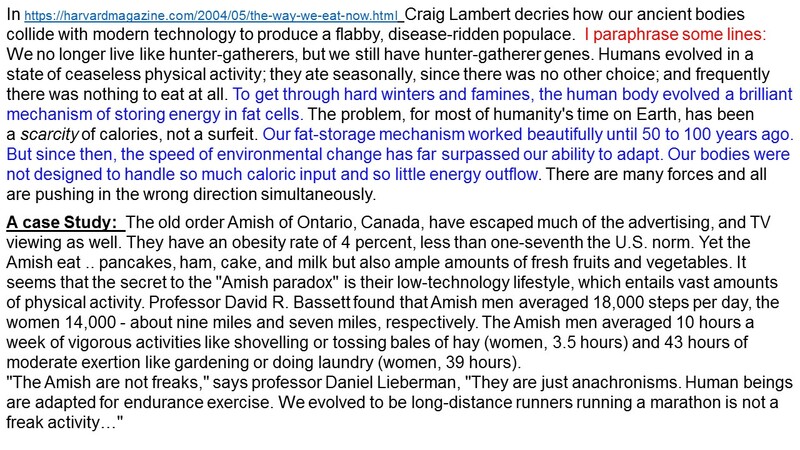 Generally, one gains weight if energy expenditure is less than the energy intake and we are now consuming more calories than ever before. Sedentary life-style is characterized by low energy expenditure and is also implicated in the rise of obesity in the past 50 years or so. But this is not the whole story. The harm done by sedentary behaviour is not completely neutralised by consuming fewer calories or increasing medium to high physical activity during rest of the day - it is an independent risk factor. It is recommended that during prolonged sitting periods, one takes short breaks to walk in order to reduce such risks. Obesity and Type 2 Diabetes: Obesity is a major factor in developing type 2 diabetes accounting for 80-85% of the risk. Type 2 diabetes is a metabolic disorder that results in hyperglycemia (high blood glucose levels). This is because in type 2 diabetes, the body (a) becomes ineffective at using insulin it has produced (insulin resistance) and/or (b) is unable to produce enough insulin. Over time, high blood glucose levels may damage the organs of the body. Obesity and The Big Food: The world has got into an impossible vicious circle. The powerful food industry with a big purse worth several billion dollars to advertise their products and with far-reaching lobbying powers is hell-bent to increase their profits - selling sugar and fat loaded foods has proved successful in the past and there is not a lot of evidence that things are changing. We have seen that giving up addiction to high calorie convenience meals is difficult to cure. 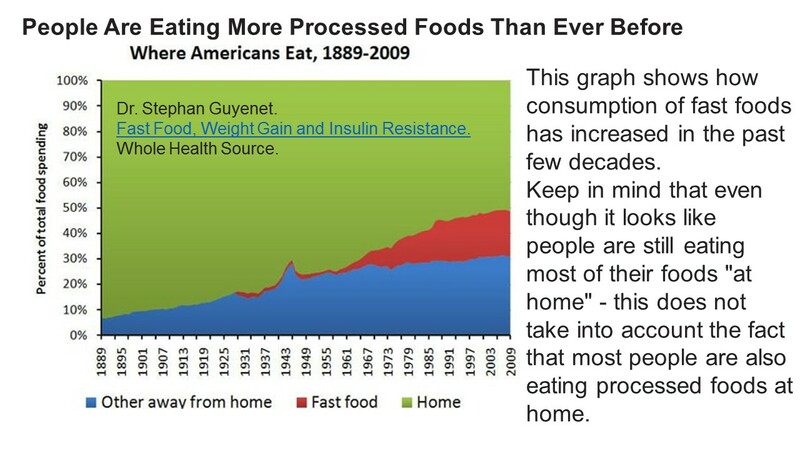 Besides Big Food, other industries have sprung up in the past fifty years or so and benefited from the obesity pandemic. The weight-watchers industry, dieting, gyms, drug manufacturers are some which readily come to mind. Their numbers have exploded - professing to control your weight and make you healthier - but obesity and related health ailments have continued to rise in line with the profits they make. 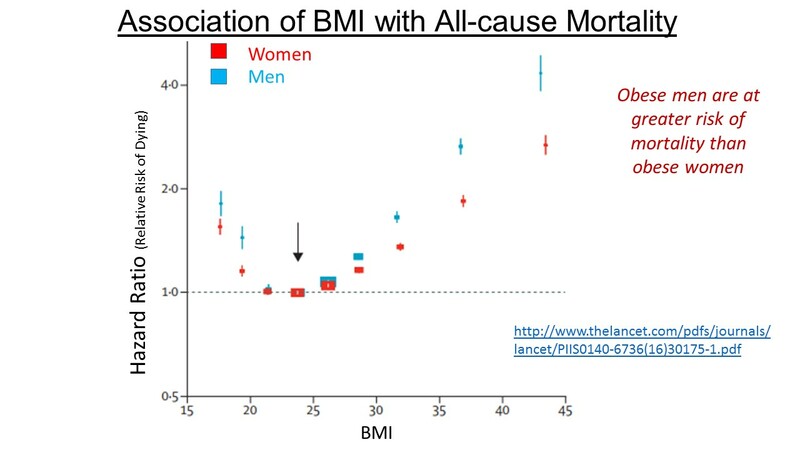 The Stigma of Obesity: We live in a judgmental society - for better or worse - there is much pressure to look slim (BMI < 20 ??) with negative attributes assigned to overweight and obese people - attributes such as lazy, work shy, undisciplined, lacking will power and more. Obesity stigma is prevalent in our society. Health professionals, family members, media all are guilty of stigmatizing obese people. A prevailing view is that it is the personal responsibility of the overweight to bring things under control and failure to lose weight is their fault - nobody else is there to blame. Faced with this environment, it is not surprising that obese people feel let down and find it stressful and depressing to get on with their normal lives. It is important that we, in the society, have a better understanding of obesity and empathize with obese people for the predicament they are in. How to Control Obesity: I do not think anybody has a complete answer but there are some obvious things that one can do to help the situation. Remember that childhood obesity is increasing at the fastest rate and excessive body fat causes physiological/metabolic changes which persist into adulthood. As adults, today's obese children will find it even harder to lose weight. We might not have seen the worst of the situation yet. Any measures to control obesity must address the childhood obesity. One is up against the industrial giants who can outspend well-minded people - they also have 'expert' representations in the regulatory bodies who make the rules. Somehow, the governments have to bring out binding regulations for food products - they did succeed in curbing smoking in public places although alcohol abuse has not been managed yet. Governments have to spend much more money in tackling obesity. In the long run, the reduced cost of treating obesity related illnesses will more than compensate the extra spending directed to curb the problem. Any measures aimed to reduce obesity must ensure that they do not require a serious sudden lifestyle change. Weight reduction must be a gradual long term process otherwise the stress created by adjusting to a new routine will make it difficult to achieve success. Reducing calorie intake must be a part of any weight reduction programme; but one only needs to reduce calories by say 10 or 15% each day to achieve significant benefits over the period of a few years. 1. Education/Awareness: Absolutely essential that the person involved understands what the problem is, what one wants to achieve and what her/his options are to do that. Also important to understand how the human body metabolizes food, calorie content of foods etc. - essentially a simple course in nutrition will be helpful. 2. Exercise: More physical activity must be encouraged. Free gym membership for obese people will help too. But the main message has to be for the general public to appreciate the need to control weight by being more active and adopting a less sedentary lifestyle. 3. Regulatory Framework: Food advertising, labeling, marketing, pricing are all parts of regulatory framework. Other measures like curbs on display of energy dense food in supermarkets, near schools etc will help. 4. Foods to Avoid: People should be encouraged to avoid eating foods with lot of fat and sugar content and change to eating more fruits and vegetables. Reducing weight should be a stress free process otherwise it is bound to fail. I have published some ideas how to lose weight in a stress free manner. There is only so much one can do in terms of education and regulation. Eating is an individual choice - food has become more affordable; and has been made more addictive by Big Food. It is a vicious cycle. Personal responsibility, for what you eat and what weight you are, is important but not always under your control. I would love to hear your thoughts on what can be done to control obesity.